The full and final iOS 8.4 (Build: 12H143) firmware version and Xcode 6.4 (Build: 6E35b) software version has been released by Apple for general public users worldwide. The official Direct Download Links of iOS 8.4 IPSW Final for iPhone 6 Plus, iPhone 6, iPhone 5S, iPhone 5C, iPhone 5, iPhone 4S, iPod 6G Touch, iPod 5G Touch, iPad Air 2 6G, iPad Air 5G, iPad 4G, iPad 3G, iPad 2G, iPad Mini 3, iPad Mini 2 and iPad Mini is available below for upgradation / updation / installation purpose. 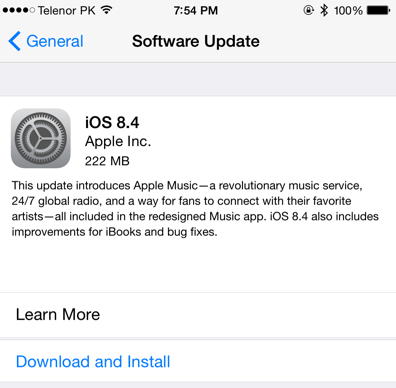 The official iOS 8.4 (12H143) firmware update release notes includes; all-new revolutionary Apple Music service along with, Beats 1 global radio service, redesigned Apple Music app, iBooks improvements and bugs fixes. You can read Full iOS 8.4 Changelog in below image! The Xcode 6.4 (6E35b) software update release notes contains; support for iOS 8.4 firmware, Swift v1.2, OS X Yosemite v10.10 SDK and iOS 8.4 SDK. How to Install iOS 8.4 Firmware? For instant iOS 8.4 OTA Update (Over-the-Air), you must navigate to Settings > General > Software Update option of your Apple iDevice. All iOS developers and non-developers (general public) can also manually install iOS 8.4 via iTunes for Free. Download iOS 8.4 .IPSW Files via Direct Links for iPhone, iPad and iPod Touch. How to Jailbreak iOS 8.4 Firmware? You can apply Untethered iOS 8.4 Jailbreak using TaiG and PP Jailbreak Tools after installation.